If there i one thing you’re sure to run into every day, it a brand new Twitter application. It seems like everyone these days wants to get their hands on the Twitter API. From Web Apps to Desktop Clients to Mobile Apps and even the Xbox 360, almost everything can tweet now. But rarely do we see a Twitter based application that has deeper inspiration than just posting tweets. *Chirp is one of those applications. It has taken tweeting to a whole new level. 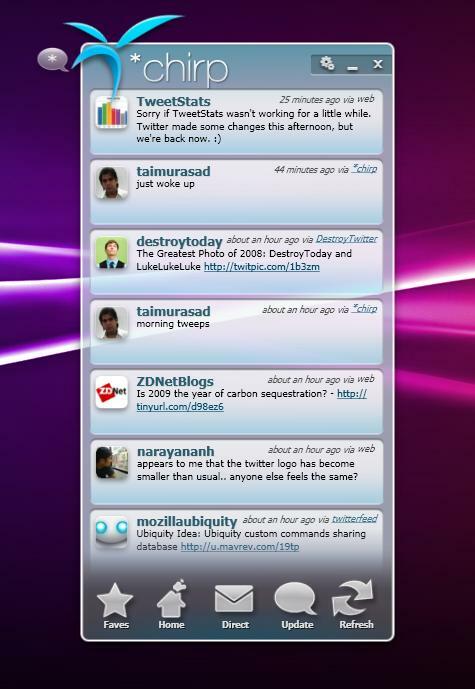 It is arguably, the best looking twitter client available today. In fact words don’t do justice to this wonder, and neither do screenshots. You have to give this a try to get the true feeling of its rich user experience. Update: The latest version of *Chirp is now named blu. Thirteen23 pulled an amazing job in engineering this application. Based on the Windows Presentation Foundation, this application has all the juice it needs to give a visual experience no other technology can. It is an art masterpiece from the ground up with silk smooth animation and alpha visual effects. The interface is clean and simple, with lots of eye candy. New tweets slide in from the right, the first time, and after every subsequent updates, the latest messages cause ripples to flow down the stack. There aren’t a lot of options to configure as there aren’t a lot of features here, but you do get to set the API usage limit, which is a much needed tweak for those who have very active friends. The update mechanics are one of the best I have ever seen in a twitter client. Too bad it doesn’t have support for TwitPic or tweet shortening and it also lacks built in TinyUrl support. The reply system also works quite well. Just click the reply button and the message would flip in 3D to let you post a reply. You can even view full conversations with a simple click. An update causes a ripple wave to flow downwards pushing older tweets to the bottom. You can scroll through the history with your mouse wheel, though there aren’t any scroll bars visible. Besides your main time-line, you can view your messages and your favorites. There isn’t any support for profiles or search yet but I’m not complaining. After all its a lot better to have lesser features and get them right, than to have a whole herd of tricks with tons of bugs. 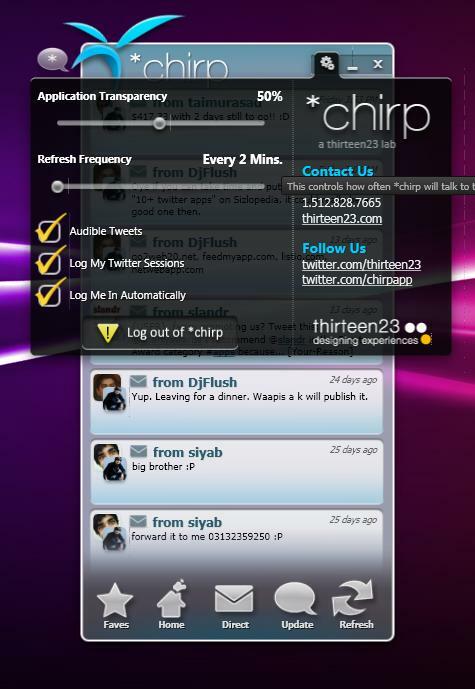 *Chirp natively runs on Windows Vista and Windows 7, and needs the .NET Framework 3.5 to run on Windows XP. From the looks of the user interface, I would love to see it on a touch device like an iPhone or even on a Windows 7 Multitouch. 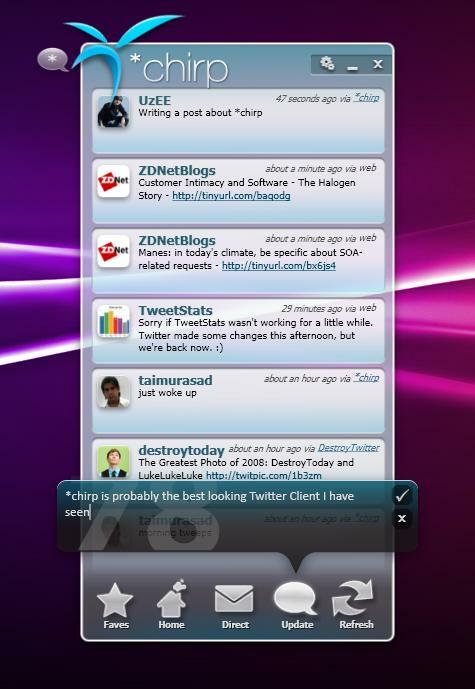 Don’t forget to share your comments and thoughts about this twitter client. You can post a comment right here, or tweet about it with a link to this post. Blu is one of those applications that have taken tweeting to a whole new level. 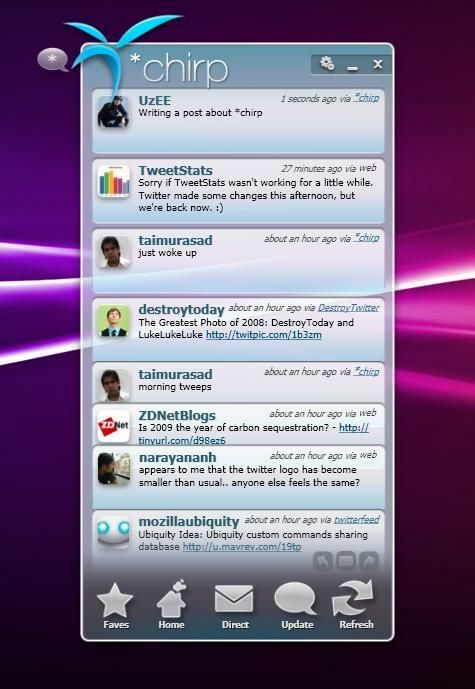 It is arguably, the best looking twitter client available today. Ran 18 queries in 0.166 seconds.